Does the net weight shown on the bag represent the weight of the kernels? Not necessarily. Rather, the net weight accounts for the total weight of the kernels, oil, and salt all together. To ensure that you are purchasing the best kit for your popcorn popper, we recommend that you shop by the popper size that is designated in our product titles. Take the mixing and measuring out of making popcorn with this hassle-free Great Western Premium America all-in-one popcorn kit! This complete popcorn kit is easy to use and provides excellent inventory control. Since the ingredients are pre-portioned, you'll be able to make just the right amount of popcorn when you need it, and you won't have large amounts left over that you'll need to toss out. This kit keeps the ingredients separate, with gourmet popcorn kernels tossed in a buttery, flavored salt on one side and pure coconut oil on the other. Simply open the top of the packet and pour everything into a 6 oz. or larger popcorn popper or pre-heated kettle - it's that easy! 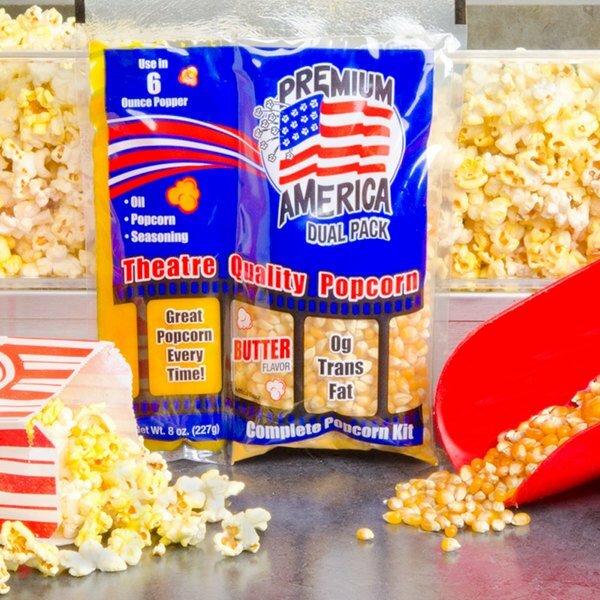 Since there are no bulk bags or tubs of popcorn ingredients required, this popcorn kit is best suited for small volume applications, including department store concession stands, school fundraising events, office break rooms, and single-house theaters. Convenient for your staff to use, this kit includes everything you need to easily make buttery fresh popcorn in minutes! The light texture and taste of the pure coconut popping oil is high grade and does not leave as much residue in your popcorn kettle as low grade varieties. The flavored kernels provide just enough salty savory flavor. 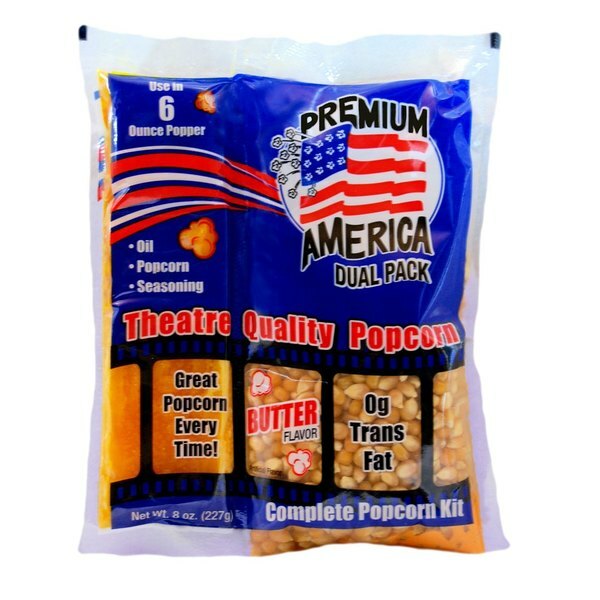 When popped, your popcorn will have the traditional, movie theater-style taste that your customers crave! Very quick and easy to use product. The popcorn with seasoning and oil is very tasty. They are a little more expensive than buying everything separately but they do work well for small batches and quick serve. These are great popcorn packages with the butter flavoured oil and salt/seasoning all in one package. They work great in the popcorn popper. They make about ten to twelve cups of popped popcorn per package. This popcorn kit is so convenient! It has everything you need to make great popcorn- the oil, the popcorn, and the seasoning. Overall a great product. Great Western all-in-one popcorn works great in my rental machine. It is comparable to any of the other all-in-one kits on the market today. I recommend it highly. We purchased 3 cases of this popcorn and we pop a batch nearly everyday. I do not care for the final result of this popcorn. The popcorn is too chewy, like it's not a really good grade or something. We used to buy a similar product from another company and was much more satisfied with it. What we got is either real old, or just not good quality corn. This is an easy product to use. The salt and corn are in one pouch and the oil is in another. Snip off the top and pour in oil first and then corn or both at the same time. This is the easiest and fastest way to make popcorn. The popcorn is fresh and makes crispy popcorn. It also has that perfect flavor. These prepared packets are great when I have others use the popcorn maker including volunteers that may not have the knowledge required to popcorn from bulk. When traveling with the popper I can throw in a handful of the ready to pop packets and I have the everything i need to make popcorn at different locations. Thank you for making sure the product is fresh. This makes popping pop corn so easy and there is no measuring required. Simply cut the pack put it in the popper and you are done. Great inexpensive alternative to bar snacks! Was a big hit at the carnival and even a bigger hit with the leftovers in the bar. Perfect! To my surprise, the product resulting from this ready-to-go popcorn packet is surprisingly 1) delicious and 2) good looking. After cooking several pouches, I can say there were less than 10 in popped kernels total! I feel its best to keep the bags hidden until ready to use. Everyone knows that what makes movie theater popcorn good is the fake butter product that goes all over it. However, people aren't going to really want to see what it looks like. It's looks pretty funky when in the pouch at roll-on temperature. But rest assured, the product is just as good as what you get at your local theater. We bought the 4 oz popcorn machine for our store and use these kits in it. Each kit makes 2 batches of popcorn which comes out great. Only problem is that you can't stop eating it. We use these for school PTO events. They pop up nicely and the flavor is very good. They're economical and that's important for our fundraising!